A couple of days ago while I was having my lunch, I was browsing some of the stupid articles on Yahoo. One that caught my eye was, "Eight Skills Your Child Should Have Before Kindergarten". And I thought, really? Aside from being able to go to the bathroom by themselves, what skills does a kid need for kindergarten? Colden goes to preschool now. At his preschool, they have a wonderful routine: the morning starts with some outside play (unless it's bitterly cold or pouring rain), and then they have a welcome circle where they sing songs and dance and say good morning to each other. After that, it's time for a little free play where they can pull out the toys, or they have an activity. (Art, painting, bread making, pizza making, etc.) Then they have a snack and a story, and then more outdoor play. If the kids are staying a full day, then they go inside and help serve up a good lunch, and then it's time for another story and some time to rest and/or nap. After the nap, it's back outside for some more outdoor play, weather permitting, and then it's time for parents to come pick up. Since he's begun this program, even just a few days a week, he's learned to tell his left from his right. He can use the bathroom (mostly) without help. He learns a new song practically every day, and he sings loud and proud when we're in the car or making dinner or setting the table. He's learned that trees can be turned into wood and furniture, or burned for heat. He's learned that plastics are made from oil. He's learned an awful lot by just running around outside with his friends, playing in the dirt, and singing songs. I should mention that the food being served is REAL food. Things like eggs and potatoes, oatmeal (not instant processed from a package), fruit, pasta and veggies, veggie sticks, vegetable soup with kid-made bread. That kind of stuff. No mac and cheese from a box, no hot dogs, no french fries. But I digress. Back to their "skills". 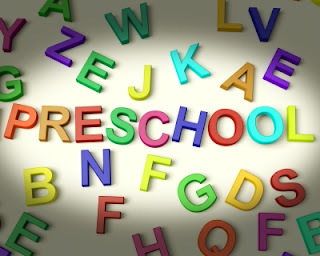 This article stated that before they start kindergarten, kids should know how to carry a tray loaded with lunch items like milk box and eating utensils; using glue; and being able to draw shapes. It stated that "the days of play based learning and naps are over, replaced by desk work". For real? Are you kidding me? When I was in kindergarten, we didn't have desks. Hell, we only had one table in the whole classroom, and it was only for art projects. We ran around. We sang songs. We played with Light Brights and read books. (Well, I read books, because I knew how to read at the tender age of four, according to my parents.) We ran around outside on the jungle gym and played kickball. We didn't have work sheets or homework. We rarely, if ever, did anything that looked like math. We were in KINDERGARTEN, for crying out loud! What ever happened to letting kids be kids? Are we really going to impose our crazy adult-competitive-world-insanity on our children now?! This kind of thing makes me just chafe at the idea of sending my kid to a kindergarten where he'll be expected to sit at a desk for six hours a day. It makes me want to enroll him instead in a Waldorf-based program, where the kids don't have to sit and look at books all day - unless they want to - and instead learn and develop their intellectual capacity by DOING things and interacting with the world around them. I can't help but wonder if all this ADHD stuff is the direct result of trying to turn our kids into little grown ups. Hell, even *I* can't stay focused some days. (Hence this second blog post in one morning, ahem.) Does that mean I need to be drugged up so that I can turn into some screen-gazing zombie all day? I think not. Little kids are full of energy. They need to run around and play and experience things - that's how little kids learn. Little kids do not learn when you stick a book under their nose and tell them to read. Some grown ups don't even learn that way! And you wonder why kids have behavior problems? We're trying to turn them into something that they're not. We're crushing their spirits. And quite frankly, if my kid can't draw or carry a tray before he gets to kindergarten, well, that's just fine with me. I can't agree with you more1 Kids need space, love, physical activity. I get so frustrated by the cutting of "extras" in the public school system. PE isn't an "extra". Art isn't an "extra". I figure that many of the ADHD cases could be minimized by good diets and physical activity. Sounds like you have a great kindergarten for your son!